Awarded bronze by ForeWord Magazine in the Book of the Year Awards 2007, Business & Economics category Quietly seething...secretly resenting...an dultimately affecting performance, employees' negative feelings toward their managers can lurk beneath the surface of even the most pleasant-seeming work relationships. These issues, if gone unchecked, can result in organizational catastrohpe. To find out what's really going on, the authors surveyed more than 50,000 employees in 65 organizations of all types and sizes, and discovered the 30 main causes of ill will. 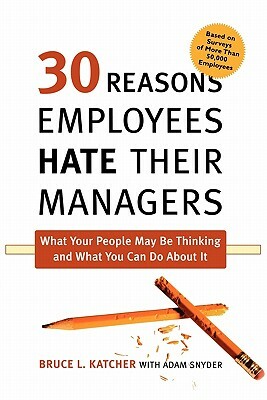 This book provides solutions for these fundamental symptoms of employee-manager discomfort, including employees' sense that: they're being treated like children / their contributions aren't respected / their manager doesn't listen to them / senior managers are incompetent / they lack the resources and training they need to do their jobs well / they get insufficient feedback / their pay isn't linked to job performance / they are burdened by heavy workloads or inflexible schedules Featuring real-life examples, this eye-opening book empowers managers to make their workplaces more productive, congenial, and satisfying for their people and for themselves.